HiFi Lounge promises "something different" and 10% discounts | What Hi-Fi? A new hi-fi shop is opening this weekend and for once we believe them when they say they're looking to offer something a little different. HiFi Lounge is set in the heart of the Bedfordshire countryside in an award-winning, eco-friendly converted Granary, and promises a more relaxed demonstration and shopping environment. Dedicated to two-channel hi-fi, HiFi Lounge has a select group of brands on show and has aimed to create a "listening environment much like you would have at home, not to create a retail shop with demo rooms". Certainly the pictures look great. 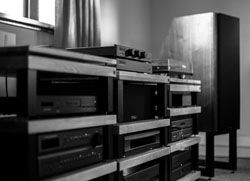 Bryston, Grado, Naim, PMC, Rega, REL and Spendor are just a selection of the brands that are set to be on sale at the HiFi Lounge. The Grand Opening is this weekend, the 27th and 28th October, and HiFi Lounge is promising an informal affair with music and film demos playing and a chance to check out the shop and plenty of new kit. For the opening weekend Rega has supplied the much anticipated RP8 turntable. There are only four in the world, and just this one in the UK – so now's your chance. The Bryston SP3 processor, PMC MB2is speakers, Oppo BDP-95 BD player and a JVC projector make up the reference system, connected with Atlas Asimi speaker cables. As an added incentive to get down there, HiFi Lounge will be offering 10% discounts on "most products" for the entire weekend. HiFi Lounge is located at the Granary Buildings, Millow, Dunton, Bedfordshire, SG18 8RH. See the HiFi Lounge website for more details.